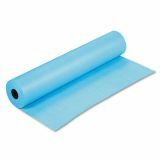 Pacon Rainbow Duo-Finish Colored Kraft Paper, 35lb, 36" x 1000ft, Sky Blue - Lightweight Kraft paper features a duo-finish surface. One side is smooth and ideal for wet media like felt pen, finger painting and fine line drawing. The other toothy side is designed for chalk, tempera, watercolor or acrylic paints. Versatile, recyclable paper is perfect for classroom projects.